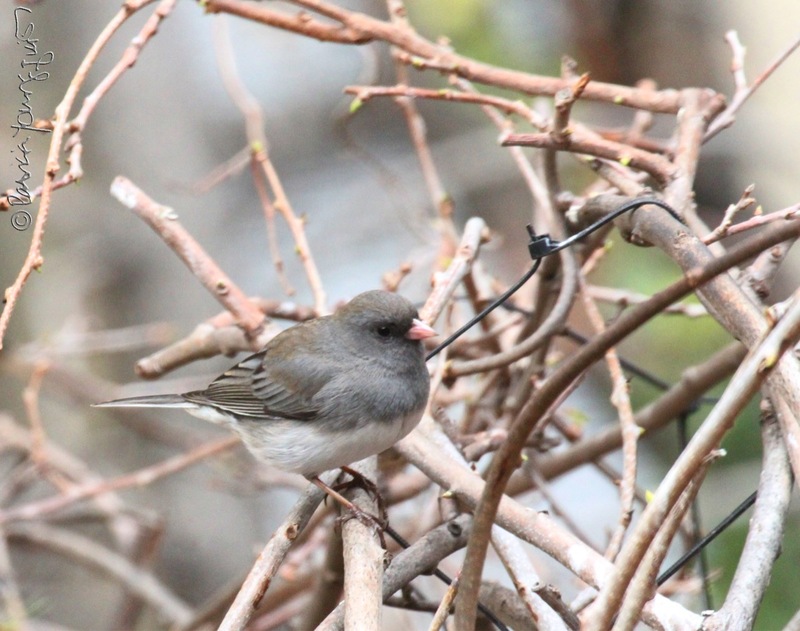 The Last Leaf Gardener: One Reason that "April is the cruelest month." 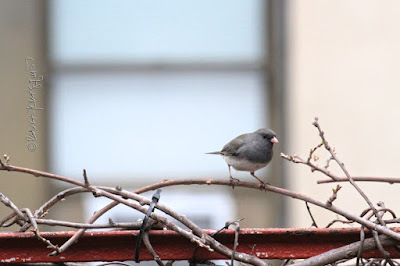 The sweet dark-eyed junco seen in the images atop this entry where the creature seems to be eyeing me from atop the ledge which surrounds my rooftop garden, is one of the reasons that I think the poet, T.S. 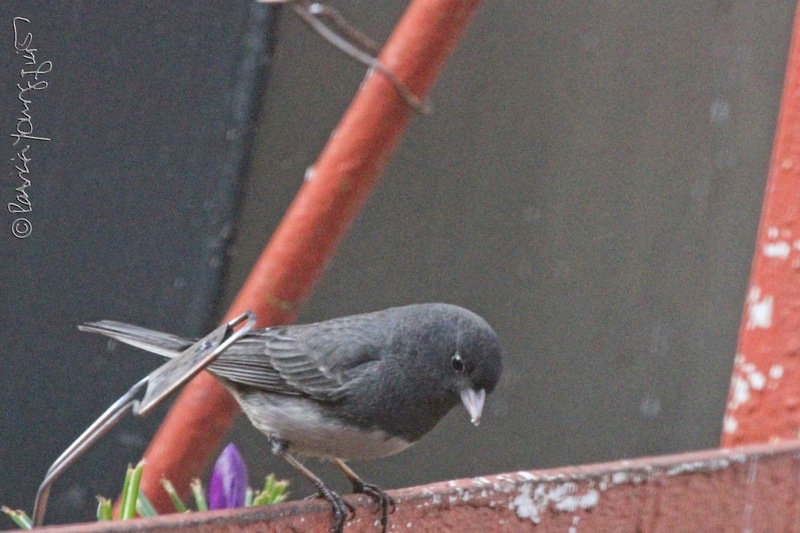 Eliot, may have been correct in saying, "April is the cruelest month." As you may know, dear reader, that particular line comes from Eliot's poem, The Waste Land, which I've referred to in bygone years in entries here on Blogger. And indeed, April can be cruel for those who live in the United States, as that's when taxes are due. 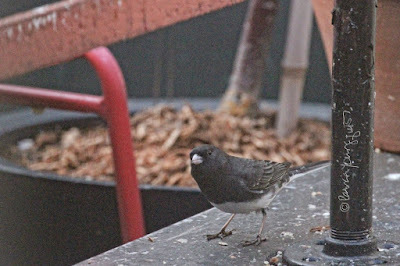 But for me, the main reason this month is cruel, at least in the area where I live (NYC), is that it is the month when the dark-eyed juncoes, after spending every day in my garden since the prior November, leave town, and do not return again until the following November. 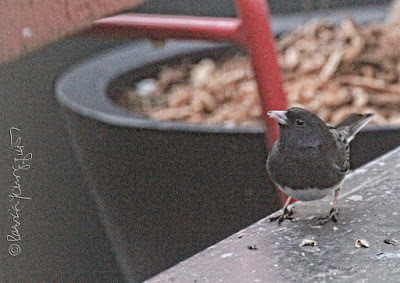 were taken on the first of April, which the last time I saw a junco at my place. Not a nice April Fool's joke — this bird type usually stays until the middle of the month, but I had a feeling based on their behavior that they might leave earlier than is their standard. 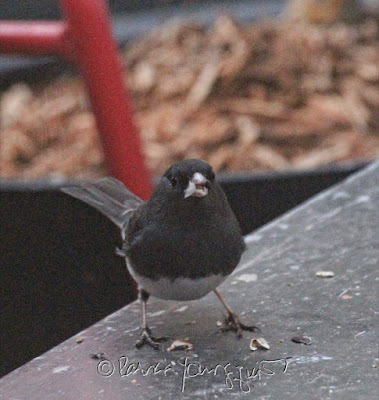 And even though they have returned in November (sometimes they even do so in late October), for the past four and a half years, I always have a fear that they won't survive their journey and I might not see them again! In any event, the reason I had a feeling that the juncoes were going to leave early this year is that they spent the last two days of March doing some serious flora-ing in my garden. 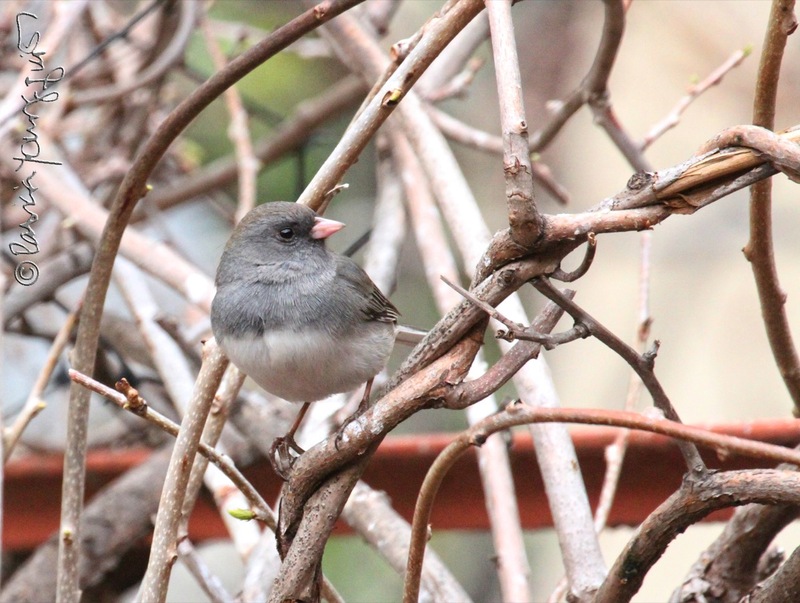 Flora-ing, is the term birds use to describe the activity of observing flora. 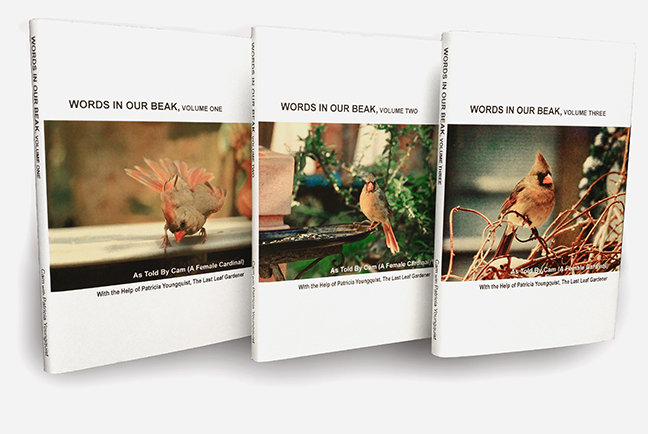 This is just one of the many habits of birds which is discussed in the book, Words In Our Beak, Volume One. 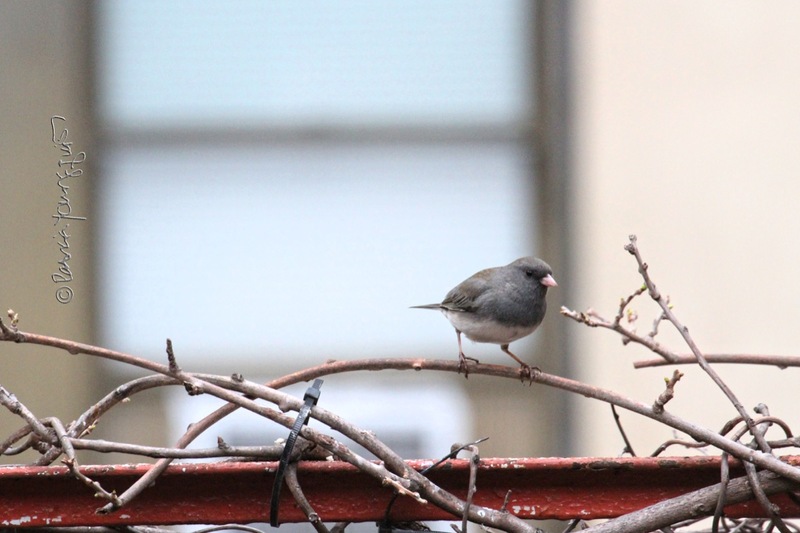 where a junco is eyeing the ever so tiny first buds of the season for my kiwi vines. 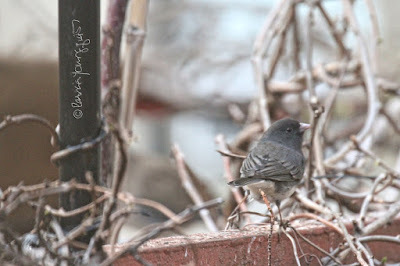 Perhaps the sight of buds is one of the ways juncoes determine if its time to get out of town. I don't know if this is true or not, but, it seems that the presence of budding, could help a snowbird (which is what juncoes are) make travel plans. 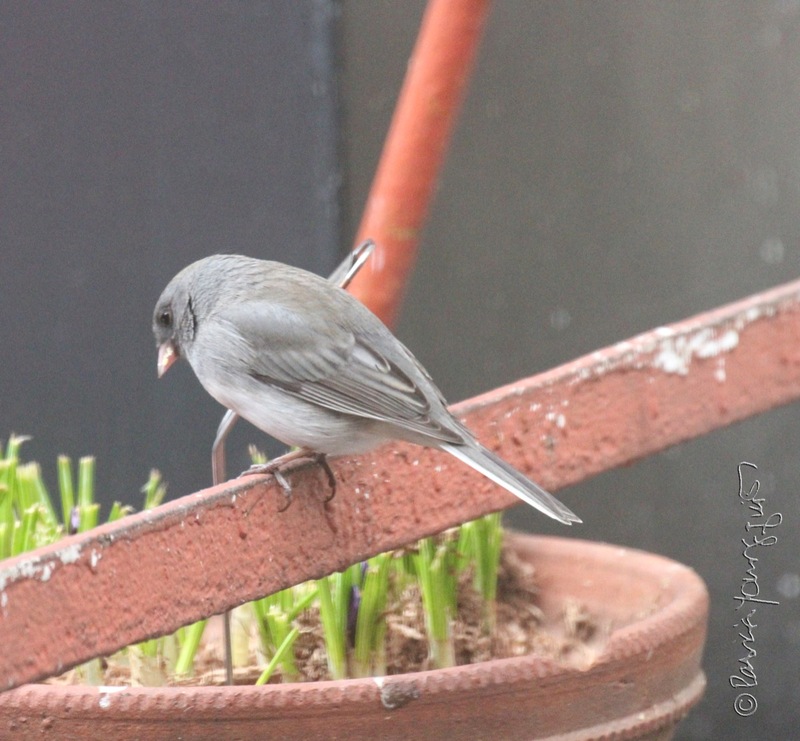 which do tend to bloom very early, even before winter ends, but the junco may be getting some clues from this plant as to how much time is left for his preferred season in NYC. 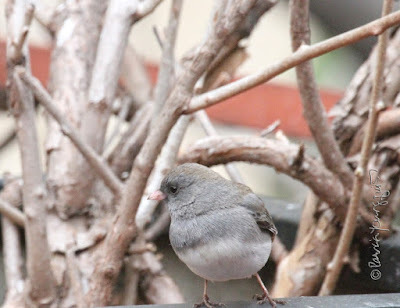 Whatever the case may be, I am saddened by the juncoes absence, and unable as of now, to apply the wisdom or philosophy Dr. Seuss, which is "Don't cry because it's over. Smile because it happened." I can only hope that my visiting juncoes have a safe journey and come to visit me again this fall and stay through the winter season.